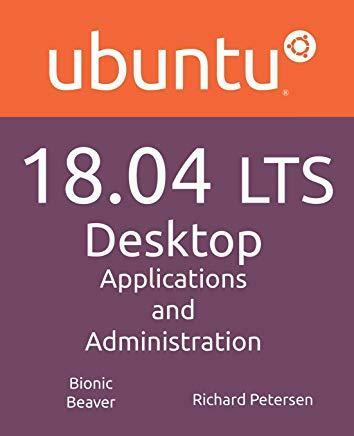 This book covers the Ubuntu 18.04 LTS (Bionic Beaver) release, focusing on applications and administrative tools. The emphasis here is on what users will face when using Ubuntu, covering topics like installation, applications, software management, the Ubuntu desktops (GNOME and KDE), shell commands, network connections, and system administration tasks. There are four parts: Getting Started, Applications, Desktops, and Administration. Part 1 focuses on getting started, covering Ubuntu information and resources, using Ubuntu Live DVD/USB discs, installing and setting up Ubuntu, upgrading Ubuntu, basic use of the desktop interface, and connecting to wired and wireless networks. Ubuntu Software and Synaptic Package manager, which provides easy and effective software management, are both discussed. Part 2 keys in on office, multimedia, mail, Internet, and social media applications. Part 3 covers the Ubuntu, Kubuntu, Ubuntu MATE, Ubuntu Cinnamon, Xubuntu, and Lubuntu desktops. as well as the BASH shell. The Ubuntu desktop with the GNOME interface is examined in detail. Ubuntu GNOME uses a Dock and a Dash (dashboard) to manage access to applications and devices. Part 4 deals with administration topics, first discussing system tools like the GNOME system monitor, the Disk Usage Analyzer, and Disk Utility (Udisks). Then a detailed chapter on Ubuntu system administration tools is presented, covering tasks such as managing users and file systems, Bluetooth setup, network folder sharing, backups, and printing. The network connections chapter covers a variety of network tasks, including manual configuration of wired and wireless connections, and firewalls (the Gufw and FirewallD).